Autumn Sunset – Let's Paint Nature! Yesterday I spent a brief chilly evening at Centennial Park in Orland Park, IL. What a beautiful sight. How amazing. Isn’t our Creator a Master Craftsman (he, he, he)? Who can reproduce this moment? Who can turn the shades of the sky from yellow to salmon, rose to periwinkle, and violet to indigo, in a quick few minutes? An explosion? HA! Ooopps…I’m gunna get some people mad! Anyway, what a beautiful sight it was! Can you see the silhouette of some fishing people on the pier? It was FREEZING! They’re brave. My hoodie wasn’t doing a very good job in the brisk wind on a 54°F evening, so I didn’t stay long. This will definitely be a painting one day! Look at all of those delicious colors! So peaceful, I hope I can translate that into my painting. Why it’s a woolly bear caterpillar!!! She named him, “Orland”, because of our location…very fitting and cute. This little guy will survive our killer winter because he produces a cryoprotectant in his tissue, sort of like anti-freeze. Amazing again! Once an adult, this little guy or girl will turn into a Isabella Tiger Moth. ← Let’s Paint Pokeberry Poison! Thank you, oh thank you for answering the decades-old mystery I’ve pondered for most of my life; what the HECK those caterpillars turn into! I SO owe you a margarita! Love the photos. I always loved the effects of light on water, myself. So intriguing. Stunning photos. Can’t wait to see the painted version! I loved how the sun looked in that first picture – all great! 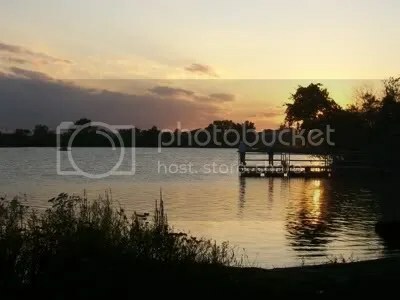 These are great photos of a beautiful sunset! It looks very calm out on the lake. 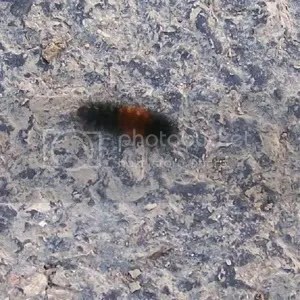 I had one of those woolly bear caterpillars in my garden recently, but I didn’t know what to call it, except caterpillar. Such beautiful, beautiful shots! 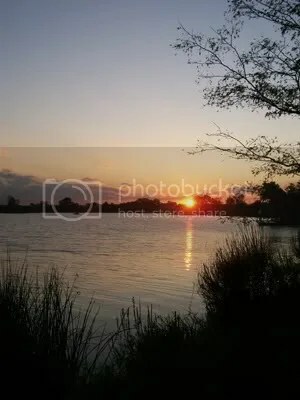 The sunset photos are inspiring and peaceful. Beautiful displays. Got to be a creator – this did not happen by accident! Drowsey: Thanks! Maybe this weekend I’ll paint it? I better not say that…every time I say I’m going to do something I run out of time! Thank you! Shelley: The sun was so amazing. How fast it set, you can actually see it move! Thanks! April: To be honest I didn’t know what he was until I got home and did some research! He is sooooo cute though. 🙂 Thank you! JJ: He was a little guy not too fuzzy…does that mean we might have a mild winter? I hope! I like snow but no deep freeze!Thanks! Crazycath: Very True! I believe you are on the other side of the pond from me but we are on the same page! 🙂 Creation rocks! Hello Naturelady; naturegirl here! You just may inspire me to pick up a paintbrush as well my camera! I like the way you caught the reflection in the water!